The Graduate College of the University of Illinois at Chicago is made up of faculty members from various disciplinary colleges in the University. In conjunction with their disciplinary colleges and under the guidelines of the Graduate College, these faculty members offer advanced academic and research programs for highly qualified postbaccalaureate students. All students admitted to a master’s program (except the Master of Business Administration, the Master of Engineering, the Master of Public Health, or the Master of Social Work programs) or a doctoral program (except the Doctor of Dental Surgery, Doctor of Medicine, Doctor of Pharmacy, Doctor of Physical Therapy, or the Doctor of Public Health at UIC) are enrolled in the Graduate College. The following master’s degrees are offered through the Graduate College at UIC: the Master of Architecture, the Master of Arts, the Master of Education, the Master of Energy Engineering, the Master of Fine Arts, the Master of Health Professions Education, the Master of Healthcare Administration, the Master of Public Administration, the Master of Science, the Master of Arts in Teaching (History), the Master of Science in Teaching (Mathematics), and the Master of Urban Planning and Policy. The Doctor of Philosophy (PhD) at UIC places traditional emphasis on the advancement of knowledge through independent research in the candidate’s chosen field and the presentation of an original thesis. The degree is intended primarily for those who want the highest level of research training and who wish to pursue careers in colleges and universities, research institutes, and public agencies or industrial and business organizations. The Doctor of Arts (DA) is a professional degree for college teachers and instructional designers. It combines the rigor and high level of scholarship in the subject matter of the Doctor of Philosophy with the acquisition of special skills in modern instructional methods. The program is designed to provide training through special courses and thesis research in such areas as curriculum design, teaching methodology, the creation of instructional materials, computer-assisted instruction, and educational evaluation. The Doctor of Arts is offered in the Department of Mathematics. The Doctor of Education (EdD) offers advanced professional studies in education leadership. It is intended for students who wish to assume leadership positions in elementary and secondary schools and in postsecondary institutions. Options are available for general leadership studies, or for study leading to Illinois school administrative certification. This program is offered by the College of Education. The Doctor of Nursing Practice (DNP) degree is a practice-focused doctoral program that prepares nursing leaders for the highest level of nursing practice beyond the initial preparation in the discipline. Graduates of DNP programs are prepared for direct care roles (e.g., nurse practitioners, clinical nurse specialists, nurse midwives) and indirect care or systems-focused roles (e.g., administrative, public health, and policy roles) or a blend of these roles. This program is offered by the College of Nursing. The Doctor of Occupational Therapy (OTD) degree provides students with advanced professional knowledge and skills in advanced therapeutic work, administration and leadership, and/or professional education. The program is offered in the Department of Occupational Therapy. UIC offers students the opportunity to pursue more than one graduate degree at the same time, either through one of our approved joint degree programs, or through concurrent enrollment in more than one UIC program. Approved joint degree programs share a defined number of courses that are applied to both degrees. Joint degree programs currently available through the Graduate College are the DMD/MS (Clinical and Translational Science); MA (Anthropology)/MPH, MBA/MS (Accounting); MBA/MA (Economics); MBA/MS (Management Information Systems); MBA/MS (Nursing); MD/MS (Clinical and Translational Science); MPH/MS (Nursing); MS (Nursing)/MS (Health Informatics); MSW/MPH (Effective Spring 2013); PharmD/PhD (Pharmacy); PharmD/MS (Health Informatics); PharmD/MS (Clinical and Translational Science) and the Medical Scientist Training Program (MD/PhD). Applicants to the Medical Scientist Training Program should request a special application from the UIC College of Medicine (312) 996-5635. Each graduate program has a director of graduate studies (DGS) who is responsible for overseeing program development, evaluating applications for admission to the Graduate College, advising graduate students, and evaluating student progress. The director of graduate studies is listed at the beginning of each program entry in this catalog. The academic year at UIC consists of two sixteen-week semesters (including the final examination periods) that begin in August (fall semester) and January (spring semester), and summer sessions that begin in mid-May and continue to August. The summer session consists of a four-week session followed by an eight-week session. Within the fall and spring terms, certain courses are offered during either the first 8 weeks (part of term A) or second 8 weeks (part of term B). The Registrar’s website at http://registrar.uic.edu details registration policy and procedure. In most programs, a student may seek admission to any academic term; however, the scheduling in many programs makes it desirable or necessary that students enter in the fall term. 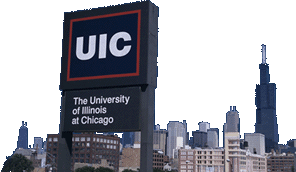 Hours of instruction at UIC begin at 8:00 a.m., Monday through Friday. Many programs offer classes in the late afternoon and evening. Administrative offices are open between 8:30 a.m. and 4:45 p.m., Monday through Friday. Applicants are considered on an individual basis. Admission decisions are made in compliance with the University of Illinois Nondiscrimination Statement listed in this catalog and on the following Web site http://grad.uic.edu/cms/?pid=1000048. Prospective students should consult the appropriate section(s) of this catalog for the specific admission requirements of each program. The Graduate College recognizes that the graduate admissions process does not, and should not, operate “blindly.” Programs and faculty members frequently recruit students of whom they have direct knowledge. Furthermore, the admission process for a doctoral program will frequently take into account the “fit’ between a prospective graduate student’s interests and those of the faculty in the program. However, the admissions process should, and should be seen to, take into account only academic and programmatic considerations when admitting and recruiting students. Program faculty participating in the graduate admissions process shall recuse themselves in any case where they have, or appear to have, a conflict of interest concerning the applicant. A conflict of interest is present if the faculty may have an interest in the outcome (admission or rejection) other than the recruitment of the most qualified applicants. This includes, in particular, any situation where there is the possibility that a faculty member might employ a prospective graduate student in a non-university activity, such as a consulting firm, biotechnology company, etc. Particular care must be taken when voting on the admission of students whose qualifications are in any fashion marginal. For further information refer to http://grad.uic.edu/cms/?pid=1001027. Degree admissions are classified as either full or limited status. Students admitted on limited standing are those admitted on a provisional basis. Requirements for limited standing admission must be approved and supported by the Graduate College. The Graduate College with the advice of the graduate department sets the conditions for limited standing. Prior Degrees Except for seniors at UIC (see Graduate Study by UIC Undergraduate Seniors), a baccalaureate or its equivalent from an accredited college or university. Transcripts Required from all institutions where the applicant earned the last 60 semester (90 quarter) hours of credit toward the baccalaureate degree and from all institutions where postbaccalaureate work has been done. Grade Point Average At least 2.75/4.00 for the final 60 semester hours (90 quarter hours) of undergraduate study, including all of the work taken in the quarter or semester in which the student began the final 60 semester hours of undergraduate study. The cumulative grade point average obtained in all work completed beyond the baccalaureate will also be computed and considered in the admissions decision. Tests Required Applicants whose native language is not English must take either the Test of English as a Foreign Language (TOEFL) or the exam of the International English Language Testing System (IELTS). The test score cannot be more than two years old. For TOEFL, a minimum score of 550 (paper-based), or 80, with subscores of Writing 21, Speaking 20, Listening 17, and Reading 19 (Internet-based TOEFL) is required by the Graduate College; many departments have a higher minimum. UIC’s Institutional Code for TOEFL is 1851. For IELTS, a minimum score of 6.5, with 6.0 in each of the four subscores is required by the Graduate College. IELTS does not use an institutional code. No other tests are required by the Graduate College, but may be required by the department/program (e.g., GRE). Letters of Recommendation Not required by the Graduate College, but may be required by the department/program. Personal Statement Not required by the Graduate College, but may be required by the department/program. Other Requirements Additional requirements of some programs include academic writing sample, portfolio, resume, etc. In addition, recommendation for admission by the graduate program to which application is made and by the dean of the Graduate College. Note: The above requirements are the minimum Graduate College requirements for admission as a degree student; most programs have additional requirements. Consult the appropriate section(s) of this catalog for the specific admission requirements of each program. Limited status is a probationary status for degree students who have not met all of the admission requirements, such as those who have less than a 2.75/4.00 undergraduate grade point average; have specified course deficiencies to be removed; must submit additional credentials required by the program (such as letters of recommendation or admissions test scores); or are UIC seniors within 8 semester hours of earning the baccalaureate at the time of matriculation. A department can recommend that a student be admitted on limited status to the Graduate College. The Graduate College makes the final decision. To admit applicants on limited status, the graduate program will recommend to the Graduate College specific conditions for admission. Graduate College approval is required for admission of limited students. Students can be admitted on limited status for no more than two semesters (including summer) or 16 semester hours, whichever occurs earlier. Graduate programs may specify shorter time limits. If the conditions are not met within the time limit, the program will notify the Graduate College and the student will be dismissed from the Graduate College. With the approval of the graduate program, the undergraduate or professional college, and the Graduate College, UIC students in their last year of study for an undergraduate degree may be admitted to the Graduate College if they are within 8 semester hours of earning the baccalaureate at the time of matriculation. These students will be admitted on limited status for no more than two terms in residence, pending completion of the baccalaureate. These students register as graduate students and are eligible for fellowships, assistantships, and graduate tuition waivers. Courses used to fulfill undergraduate degree requirements are transferred back to the undergraduate college and cannot be applied to a graduate degree. Applicants who are admitted to limited status pending completion of their bachelor’s degree must be awarded the undergraduate degree within two terms in residence. If this condition is not satisfied, graduate admission is cancelled and the student is transferred back to the undergraduate college. Application is through an online form which may be accessed at http://grad.uic.edu/cms/?pid=1000019. Applications and supporting credentials should be submitted as early as possible. Applications received after the deadline will be returned to the applicant. Some graduate programs have application deadlines that are earlier than the University deadline, and some admit students in the fall semester only. Prospective applicants should contact the program of interest for information on current deadlines. Graduate College Application, completely filled out and submitted electronically. Nonrefundable application fee of $60. This fee is waived for applicants seeking readmission who have been previously enrolled at UIC as a graduate student, and employees of UIC. Official transcripts, which must be sent directly from the issuing school to UIC’s Office of Admissions. Test scores, which must be sent directly from the testing service to UIC (Institutional Code for GRE is R1851; for GMAT is 1929). Graduate College Application, completed and submitted electronically. Nonrefundable application fee of $60 (U.S. currency). This fee is waived for applicants seeking readmission who have been previously enrolled at UIC as a graduate student, and employees of UIC. Official transcripts must be sent directly from the issuing school to UIC’s Office of Admissions. TOEFL, IELTS, and other test scores must be sent directly from the testing service to UIC (Institutional Code for TOEFL is 1851; for GRE is R1851; for GMAT is 1929). Declaration and Certification of Finances form http://www.ois.uic.edu/files/Dec%20of%20Finances%20Fall%202009.pdf. Applicants who have completed studies outside the United States must present all postsecondary school credentials. Such credentials must include a record of all studies completed to date, grades or examination results received (including failing as well as passing grades), maximum and minimum grades obtainable, rank in class, degrees, diplomas, and certificates earned, and length of the school year. Documents must be authentic, and those not written in English must be accompanied by certified English translations. Copies are acceptable when certified as authentic by the issuing institution. All documents should be sent directly to UIC by the issuing institution. Applicants whose native language is not English must take either the Test of English as a Foreign Language (TOEFL) or the exam of the International English Language Testing System (IELTS). The test score cannot be more than two years old. The TOEFL is administered by the Educational Testing Service, Box 899, Princeton, NJ 08540. The Graduate College requires a minimum score of 550 for the paper-based test; or total score of at least 80 for the Internet-based (iBT), with minimum subscores of Writing 21, Speaking 20, Listening 17, and Reading 19. Many departments have higher minimum TOEFL requirements. Consult the department listing for details. UIC’s Institutional Code is 1851. The IELTS is administered by the International English Language Testing System and is jointly managed by the British Council, IDP: IELTS Australia and the University of Cambridge ESOL Examinations (Cambridge ESOL) through more than 500 locations in 120 countries. The Graduate College requires a minimum total score of 6.5 and minimum subscores of 6.0 for each of the four sections. Many departments have higher minimum IELTS requirements. Consult the department listing for details. UIC’s mailing address for IELTS results is: UIC Office of Graduate Admissions (MC 018), Box 7994, Chicago, Illinois 60680-7994. The TOEFL and IELTS are given at regularly scheduled intervals at testing centers throughout the world. Information on testing dates, locations, and the testing fee may be obtained at American embassies and consulate offices of the U.S. Educational Foundation (also consult http://www.ets.org and www.ielts.org). The TOEFL or IELTS examination is not required for students who have completed at least two academic years of full-time study in a country where English is the native language and in a school where English is the language of instruction within five years of the proposed date of enrollment in the University. International applicants granted admission to the University, where applicable, will receive visa request documents from the Office of International Services to assist in the application for a visa to enter the United States. Official admission letters are sent from the Office of Admissions. International applicants admitted to online programs are not eligible to receive a student visa or I-20. International students must be able to finance themselves fully, including room and board, tuition, books, other expenses, and travel to and from the United States. Only a limited number of assistantships are available, so applicants should not plan on any financial assistance from UIC unless they receive a written offer of aid from a department. All international applicants who plan to finance the cost of attending UIC from personal resources must certify that they will have available sufficient funds to cover their academic and living expenses for the academic year, plus living expenses for a summer. The exact amount required is set each year by the University of Illinois Board of Trustees. The amount is subject to change depending on tuition and room/board changes. The appropriate certification form can be obtained from the Office of International Services Web site http://www.ois.uic.edu/files/Dec%20of%20Finances%20Fall%202009.pdf. Applicants who are unable to provide satisfactory evidence of adequate finances or who have not sent a notarized certified statement verifying funds available and their source will not be granted admission. Official admission letters and visa documents cannot be sent until certification is received. International students may apply for fellowships, assistantships, and tuition waivers. These financial aids are awarded on the basis of outstanding scholarship and academic merit. Contact the director of graduate studies of the program of interest for more information. If awarded, this aid is included in the total funds that the international applicant is required to have for proof of sufficient finances. Illinois state law requires that the University attest to the English proficiency of all classroom instructors, including teaching assistants. Teaching assistants who are not native speakers of English (regardless of their citizenship status) must have their oral English proficiency assessed by the appointing department. The method of assessing English proficiency is at the discretion of the appointing unit and may include standardized tests and/or interviews. The department head of the hiring unit must certify in writing that the student has sufficient oral English proficiency to provide classroom instruction before the student’s appointment papers will be processed. Individuals who do not wish to pursue a degree but want to take courses for professional or scholarly reasons or personal enrichment. Individuals who have been out of school for several years or in a different field of study and wish to take a few courses before deciding whether to apply for a degree program. Prior Degrees A baccalaureate or its equivalent from an accredited college or university. Nondegree applicants must submit proof of the degree with their application. Transcripts Not required by the Graduate College. Tests Required Applicants whose native language is not English must take the Test of English as a Foreign Language (TOEFL). The test score cannot be more than two years old. The Graduate College requires a minimum score of 550 for the paper-based test; or total score of at least 80 for the Internet-based (iBT), with minimum subscores of Writing 21, Speaking 20, Listening 17, and Reading 19. Many departments have higher minimum TOEFL requirements. UIC’s Institutional Code is 1851. No other tests are required by the Graduate College. Other Requirements International students who require certification of admission (I-20 or DS-2019) sent to the U.S. Citizenship and Immigration Services (USCIS) will not be admitted as nondegree students. Some programs require additional credentials for nondegree admission, and some programs do not admit nondegree students. Applicants can be admitted as nondegree, but remain ineligible to register for certain classes. It is the responsibility of the applicants to contact the program offering the course(s) to determine their eligibility to enroll. Nondegree graduate students interested in changing to degree status must submit a Graduate College Application online. All application credentials must be on file before the change to degree status will be considered. The application and all credentials must be submitted by the degree application deadline of the program to which the student is applying. No more than 12 semester hours of credit earned as a nondegree student can be transferred into the degree program. Students must file a petition for the transfer of nondegree credit; only graduate-level courses taken in the last six years in which a grade of A or B was earned will be considered. See Transfer Credit for more information. Note: Admission to nondegree status does not obligate the Graduate College or any graduate program to later admit a student to a degree program. Currently enrolled graduate students who wish to change to or add a second degree program, or change between master’s and doctoral levels within a program, must submit a completed Request for Change of Graduate Program form to the Graduate College at least two weeks prior to the term for which the change is requested, although some programs may have an earlier deadline. This form must be signed by both the old and new departments, and for international students on an F-1, J-1, or J-2 visa, the Office of International Services. Students should meet with the director of graduate studies of the new program to discuss procedures, deadlines, and credentials required. A Petition for Transfer Credit listing all previously completed courses accepted by the new department should be attached to the Request for Change form, if applicable. Students must use the Request for Change of Graduate Program form to transfer within the Graduate College or between the Graduate College and the MBA Program, the Master of Engineering Program, the Master of Public Health, the Doctor of Public Health, or the Master of Social Work Program. Complete instructions and deadlines are detailed on the back of the form. The form is available from the Graduate College Web site, https://grad.uic.edu/pdfs/form_Chprfrm3.pdf. The University of Illinois at Chicago offers six basic types of financial aid for graduate students: fellowships, assistantships, tuition-and-selected-fee waivers, traineeships, loans, and employment. Applicants for these types of aid must be admitted to a graduate degree program or have a completed application pending. Eligibility for loans is determined by the Office of Student Financial Aid. Applicants for loans should go directly to the Office of Student Financial Aid. Applications for fellowships, assistantships, and tuition/fee waivers are available in the department office, the Graduate College Office, and on the Graduate College Web site. In the administration of these programs and in selecting students for participation in them, the University of Illinois at Chicago adheres to the Nondiscrimination Statement printed in this catalog and on the following Web site, http://www.uic.edu/depts/oae/Nondiscrimination.html. Fellowship stipends are awarded in recognition of scholarly achievement and promise. They enable students to pursue graduate studies and research without a service requirement. The stipends of different fellowships vary. Unless explicitly stated otherwise, the following fellows supported by the Graduate College receive a tuition-and-selected-fee waiver: University Fellowships, University/Deiss Fellowships, Dean’s Scholar, Abraham Lincoln Fellowships, and Diversifying Higher Education Faculty in Illinois (DFI). Fellows may engage in paid employment only to the extent permitted by the award and approved in writing by the dean of the Graduate College. The following fellowships are available through the Graduate College: University Fellowships, University/Deiss Fellowships, Dean’s Scholar Award, Abraham Lincoln Graduate Fellowships, Diversifying Higher Education Faculty in Illinois (DFI) Fellowships, and the Chancellor’s Graduate Research Fellowship. The Graduate College also offers the Provost’s Award and the Deiss Provost’s Award to support graduate student research projects. Please refer to http://grad.uic.edu/cms/?pid=1000082 and http://grad.uic.edu/cms/?pid=1000083 for more information. Additionally, students may consult the Graduate College’s external fellowship and financial aid coordinator for information on all types of graduate funding. The coordinator assists students in finding funding opportunities and aids them with their applications. Please refer to http://grad.uic.edu/cms/?pid=1000078 for more information. The colleges, graduate programs, administrative offices, and research centers appoint graduate students as teaching, research, or graduate assistants. Work Schedule The weekly clock hours of service required of assistants are twenty for a half-time appointment and the proportional fraction of time for other appointments. Stipend The minimum stipend for an appointment of 50 percent time for the nine-month academic year is $14,565 (in AY 11-12 ); many departments offer a greater amount. Waivers Tuition, the service fee, the health service fee, the library and information technology assessment, and the academic facilities maintenance fund assessment are waived for assistants if the appointment is between 25 and 67 percent for at least three-quarters of the term (91 calendar days in fall or spring semester, 41 calendar days during the summer session). Consult the Academic Human Resources Web site for specific dates that will satisfy the 91-day and 41-day requirements http://www.uic.edu/depts/hr/uichr/ahr/minimagrad.html. Graduate students who hold academic appointments as assistants for the spring semester and for whom tuition and selected fees have been waived are entitled to a waiver for the summer term immediately following, provided they are registered for at least three hours during that summer term. Registration Requirements Graduate students who hold academic appointments as assistants are required to register for at least 8 hours each semester. Some programs may require registration for more than 8 hours per term and/or summer registration. International students on an F-1 visa must register for a minimum of 8 hours for a 50% appointment, 10 hours for a 33% appointment, and 12 hours for a 25% appointment. The Graduate College does not require summer registration; however, a minimum of 3 hours registration is required to receive a summer tuition-and-selected-fee waiver. UIC provides a limited reserve of Board of Trustees (BOT) waivers to the UIC Graduate College, which are awarded to programs in three ways: allocated per semester, for students who have won individual internal and external fellowships, and for students selected for external training grants by programs. (These are distinct from the tuition-and-fee waivers allocated with assistantships.) Students who are interested in receiving a waiver must speak to the director of graduate studies for their program. All waivers are requested by the academic program and conveyed to the Graduate College, not by the student. A student holding a BOT waiver must fulfill certain registration requirements. The student must also be in good standing. Tuition, the service fee, the health service fee, a portion of the health insurance fee, the library and information technology assessment, and the academic facilities maintenance fund assessment are waived as well as any differential tuition when assessed; the remainder of the health insurance fee and other fees are the student’s responsibility. Part-time BOT waivers are available to those in specific programs designated by the Graduate College. Registration Requirements Students with a BOT waiver must register for at least 12 hours per semester (6 in the summer term). If a student drops below 12 hours of registration at any time during the semester (or 6 hours in the summer term), the waiver is rescinded and the student is billed the tuition, service fee, health service fee, library and information technology assessment, the academic facilities maintenance fund assessment, and the differential when assessed. Students who hold a BOT waiver due to having received a fellowship or being put on a training grant need to consult with the Graduate College if they wish to hold any sort of assistantship while on the fellowship, and the Graduate College reserves the right to refuse the request or rescind the BOT waiver. Students who hold a departmental allocated BOT waiver are not permitted to simultaneously hold any sort of assistantship, but may accept part-time employment, not to exceed twenty hours a week, within the University. Training grants are awarded to graduate programs to support student involvement in specific activities. The grant may support students with stipends and/or tuition-and-selected-fee waivers. To be eligible, students must be admitted to a graduate degree program or have a completed application pending. Students should contact the director of graduate studies in their program for information on the availability of traineeships. Many training grants support students from related departments, and are interdisciplinary in nature. Various industrial firms, foundations, and private individuals have generously donated funds to support a number of special fellowships for graduate students at the University of Illinois at Chicago. The stipends and supplemental allowances of these fellowships are not uniform, and most are restricted to students in particular areas of study. Students should contact the director of graduate studies in their program for information on the availability of special fellowships. The Illinois Veterans Scholarship covers the admissions application fee, tuition, and a small varying portion of the service fee. Contact the Office of Student Financial Aid, Room 1800, 1200 West Harrison Street, (312) 996-3126, for more information and applications. Students should bring a copy of their DD-214 when submitting an application. UIC’s Office of Student Financial Aid (OSFA) awards and coordinates assistance from a variety of federal and state financial aid programs. Graduate students are eligible for Federal Stafford Loans, Graduate Plus Loans, Federal Work Study, and private loans. Applicants for financial aid awarded through the OSFA must be U.S. citizens or permanent residents and must have applied for admission to a degree-granting program of the University. To receive assistance, students must be admitted to and enrolled in a degree-granting program. Students may also consult the external fellowship coordinator in the Graduate College for further information about outside sources of funding opportunities. Please refer to http://grad.uic.edu/cms/?pid=1000079. Graduate students are governed by the policies of the University of Illinois at Chicago, the Graduate College, their disciplinary (line) college, and their department, and they are expected to become familiar with these policies. The Graduate Catalog in effect when the student begins enrollment in a degree program is the primary source of information on Graduate College policies pertaining to the student. Many of the University and departmental policies are listed in this catalog, and most programs have policy manuals for graduate students. When a department requirement is approved by and exceeds that of the Graduate College, it replaces the Graduate College standard. Students may not add or drop a course after the tenth day of instruction in a semester unless approved by the director of graduate studies and the Graduate College. Please check the Office of the Registrar Web site http://www.uic.edu/depts/oar/registration/policies_procedures.html#dropping for the summer session deadlines. No refund of tuition will be issued for a drop after the tenth day of instruction regardless of final deadline, unless the student withdraws from the University (see section on fees). Consult the Schedule of Classes, published each term, for current deadlines (https://ossswebcs.admin.uillinois.edu/PORTAL_UIC/classsch.html). Holders of fellowships, assistantships, and tuition and fee waivers must maintain the required number of semester hours through the end of the term or risk loss of their tuition-and-selected-fee waiver for the term. Students who lose their waivers will be billed the full cost of tuition and fees. Students on visas must maintain the registration requirements of their visa (for clarification, contact the Office of International Services). All graduate students must have an academic advisor in the graduate program in which degree work is to be done. The academic advisor assists in planning a program of graduate study that fits the needs of the student and satisfies the graduate program and Graduate College requirements. New students should consult the director of graduate studies to discuss the selection of an academic advisor. All PhD candidates must have a dissertation advisor who is a member of the Graduate College faculty. Both master’s and doctoral students must have a major advisor (academic or research) who is a member of the Graduate College faculty. Unassigned nondegree students do not have a formal advisor. These students must receive approval from an authorized person in the program(s) offering the course(s) they wish to take each term prior to attempting registration. The Chicago Metropolitan Exchange Program (CMEP) is an agreement between the University of Illinois at Chicago, Northwestern University, and the University of Chicago that enables doctoral students to take advantage of educational opportunities—specialized courses, unique library collections, or laboratories—at these campuses. CMEP participants should have matriculated into a doctoral program at UIC and must receive prior written approval from their advisor, their department head, and the UIC CMEP liaison officer. With these approval signatures, students must then seek permission from the host institution to take the desired course(s). The application and approval process must be accomplished using CMEP form. CMEP traveling scholars register and pay for the CMEP credit at UIC (and UIC rates) and also make arrangements to register at the host institution through its CMEP liaison officer. A leave of absence is not required, since participants are registered at UIC during their stay at the other institution. Students should consult their director of graduate studies, the Graduate College Web site or the UIC CMEP liaison officer in the Graduate College for more information. See http://grad.uic.edu/cms/?pid=1000979. In addition to the Chicago Metropolitan Exchange Program (CMEP), students registered at UIC are eligible to take courses offered at the University of Illinois at Urbana-Champaign through the process of concurrent registration. Students must be registered at UIC for the term they are attempting concurrent registration. Approval is needed from the student’s UIC department and the department offering the course in Urbana. Students should consult with the UIC Registrar’s Office on process and additional information. Are making satisfactory progress toward degree requirements, including a project or thesis if required. Academic Standing as viewed in the student database and Student Self-Service in my.uic.eduonly reflects the result of the minimum Graduate Degree GPA as listed above. Students on limited status admission who have a Graduate Degree GPA of 3.00 or higher are listed in good standing, and unless specified by the graduate program, are eligible to hold assistantships and tuition waivers. Note: Graduate programs may require a higher level of performance and may apply criteria in addition to those stated above. If a student fails to meet the performance or other criteria stated by the program as determined by the Graduate College, the program may notify the Graduate College to initiate dismissal. Limited admission status students must meet the conditions imposed by this status and progress to full degree status within two semesters or any shorter amount of time set forth in the letter of acceptance. Failure to do so will result in dismissal from the University. The Graduate Degree GPA is the average of grades earned by graduate students in their current degree program, whether or not the courses are part of degree requirements. Only graduate-level courses in which an A, B, C, D, or F is earned are included in the Graduate Degree GPA computation. A graduate-level course is any 400- or 500-level course, and any 300-level course taken under the quarter system. General transfer credit taken at other institutions is not computed in the Graduate Degree GPA. However, grades earned through the CIC Traveling Scholar Program are included. Grades earned as a nondegree student, or while a student in other UIC colleges or a different graduate program, will be computed if the courses are applied to the current graduate program through an approved transfer of credit petition. Academic probation is the Graduate College’s mechanism for warning students that their Graduate Degree GPA has fallen below the minimum standard of 3.00/4.00. Students have two terms of enrollment (including summer, if registered) after the term in which their Graduate Degree GPA falls below 3.00 to remove themselves from probation. Departments may enforce stricter limits on probation, provided the student is informed in writing prior to being placed on probation. Students who leave the University while on probation, whether through formal withdrawal or through failing to meet the registration requirement, will still be on probation if they are later readmitted to the same program. Students who are admitted to a new program begin as new students (i.e., the Graduate Degree GPA starts over). Students currently on probation or who left the University on probation will not be admitted to the same program as nondegree students. Readmission as a degree-seeking student is not guaranteed. Students who fail to raise their average to 3.00 or to otherwise fulfill the terms of their probation within the deadline will be dismissed from the University. The Graduate College issues probation and dismissal notices to students and their program directors. However, failure to receive notice does not change the student’s probation or dismissal status, since students are expected to monitor their own progress in light of Graduate College policies. Students who can devote full attention to their studies usually enroll for 12 to 16 semester hours each term. In exceptional cases, the advisor and director of graduate studies may permit a student to enroll for up to 20 hours. Registration for more than 20 hours is not recommended but is possible with approval of the director of graduate studies. The Graduate College at UIC has defined full-time enrollment as 9 hours each fall and spring term and 5 hours in the summer. Half-time is defined as 5 hours each fall and spring term and 3 hours in summer. Three-quarters time is defined as 8 hours each fall and spring semester and 4 hours in summer. (b) 8 hours of registration during the fall and spring semester and a 50% graduate assistantship. Students on an F-1 visa may be eligible to register for zero hours if all requirements are complete except for project or thesis (if not a recipient of a fellowship, tuition-and-selected-fee waiver, or assistantship), and a petition is submitted to the Graduate College and approved. The petition must be endorsed by the advisor, DGS, or head of program and the Office of International Services. For questions regarding immigration and SEVIS requirements, please contact the Office of International Services. Fellowship Holders Must register for at least 12 hours of credit per semester of award (summer registration optional but if the tuition-and-selected-fee-waiver is to be used a minimum of 6 hours is necessary). Tuition-and-Selected-Fee-Waiver Holders Must register for at least 12 hours of credit per semester of award (6 in summer). Assistantship Holders Must register for at least 8 hours of credit each semester of appointment, excluding summer. International students on an F-1 visa must register for a minimum of 8 hours for a 50% appointment, or 9 hours for an appointment less than 50%. While summer enrollment for assistants is optional, assistants who wish to use their summer tuition-and-selected-fee waivers must register for at least 3 hours during that term. Some graduate programs may require registration for more than 8 hours per term and/or summer registration. There are no tuition-and-selected-fee waiver benefits for students employed with less than 25% or more than 67% appointment. Assistants who qualify for a spring tuition-and-selected-fee waiver automatically receive a summer waiver if registered in at least 3 hours in summer unless holding a summer appointment above 67%. Academic departments may have specific registration requirements. Please check with the department to be sure all departmental requirements are met. Courses numbered 001–099 do not carry academic credit but meet special program requirements. These courses carry semester hours that do not count toward the total hours required for graduation, but do count in the calculation of tuition and toward full- or part-time enrollment status and financial aid eligibility. Grades for these courses are not calculated in the grade point average. Courses numbered 100–399 are generally intended for undergraduate students. Graduate students may need to enroll in such courses as prerequisites for more advanced courses or for general knowledge about a subject. Availability may be limited for some courses until undergraduate enrollment is determined. Grades for these courses are not calculated in the Graduate Degree GPA. Courses numbered 400–499 are intended for advanced undergraduate and graduate students. Students will note that some 400-level courses listed in the catalog and Schedule of Classes have sections (CRNs) with differential credit (i.e., one CRN is offered for 3 semester hours for undergraduate students and one CRN is offered for 4 semester hours for graduate students). Undergraduate students who enroll in a 400-level course should enroll in the designated, lower-credit-level CRN. Graduate students should enroll in the designated, higher-credit-level CRN. If taken as an undergraduate with the intention to later transfer the credit into a graduate program at UIC, only the lower-credit would transfer. Courses number 500–599 are intended for graduate students. Courses number 600 and above are intended for medical professional degrees (eg., DMD, MD). Credit is not allowed for students in Graduate College programs. A—4 grade points per semester hour. B—3 grade points per semester hour. C—2 grade points per semester hour. D—1 grade point per semester hour (not accepted as degree credit). F—0 grade point per semester hour (failure; not accepted as degree credit). DFR—grade temporarily deferred. Deferred grades may be used for thesis courses, continuing seminar, sequential courses, and certain courses that require extensive independent work beyond the term. At the end of the continuing course sequence the deferred grade for all terms must be converted either to a specific letter grade (A–F), to an IN (Incomplete), or to an S or U. No credit is earned until the DFR grade is converted to a permanent grade. I—Incomplete. An incomplete grade may be given only if, for reasons beyond the student’s control, required work has not been completed by the end of the term. An I must be removed by the end of one calendar year after the term in which the I was received. Note: Course instructors may require an earlier deadline. An I that is not removed by the deadline will remain on the student’s record as an I, with no credit earned (or may be replaced by a grade, at the instructor’s discretion, before the Graduate College deadline to change an I grade). A course in which an I was received and not removed by the deadline may be repeated for credit only once. CR—Credit; NC—No Credit. Used only in courses taken under the credit/no credit grading option. No grade points are earned and the grade is not computed in the grade point average. If the required work for the course has not been completed by the end of the term, at the instructor’s discretion an I may be given. Graduate students may take courses on a credit/no credit basis provided that: (1) the courses are not within their immediate area of specialization, (2) such courses account for no more than one-sixth of the total number of course hours taken at the University of Illinois at Chicago and counted toward a degree, and (3) they declare their intention to take a course on this basis at the time of registration and have the approval of their advisor and director of graduate studies. Some programs do not allow any credit/no credit courses to be used toward degree requirements. Credit/No credit grades cannot be changed to grades A–F at a later date. S—Satisfactory; U—Unsatisfactory. Used as grades in thesis research courses, in zero-credit courses, and in specifically approved courses. No grade points are earned and the grade is not computed in the cumulative grade point average or the graduate degree grade point average. In the case of thesis research courses, instructors should assign an S or U grade to the course each term. They may assign a DFR grade each term until after the thesis defense is successfully completed, the thesis committee accepts the format and content of the thesis, and the Graduate College approves the format of the thesis, but this is not recommended. In the latter case, the Graduate College will notify the registrar to change the DFR grades to S. An Unsatisfactory grade can be assigned at any time when the student is not making satisfactory progress in thesis research. If this should occur, the status of the student will be reviewed by the advisor, the director of graduate studies, and the Graduate College, and the student may be dismissed from the Graduate College. W—Withdrawn. Officially withdrawn from the course without academic penalty; no credit is earned for the course. Assigned if course is dropped after the tenth day of the semester (fifth day in summer) and before the last day of instruction for the term. This grade will remain on the transcript but does not affect the grade point average or Graduate Degree Grade Point Average. AU—Visitor/Audit. Current students who successfully complete a Visitor’s Permit by the registration deadline may request that the course be included on the official transcript with a grade of AU; no credit is earned for the course. Except for international students whose visas require continuous registration, and doctoral students who have passed their preliminary exams, graduate degree-seeking students may take one semester (fall or spring) plus the summer session off without formal leave approval from the Graduate College. Degree students who desire to take an additional consecutive semester off, for a total maximum of three consecutive terms, must file a Graduate Petition for Leave of Absence by the tenth day of the third term for which leave is requested. Nondegree students are not eligible for a leave of absence. International students who hold an F-1 or J-1 visa must register each fall and spring semester due to visa requirements. Such students must file a Graduate Petition for Leave of Absence for any fall or spring semester they wish to take off, obtaining written authorization on the petition from the Office of International Services. If remaining in the country, such leaves are rarely granted by that office. Upon receipt of a leave of absence petition from the department/program, the Graduate College will automatically approve the first leave, up to one year maximum. At least one term as a graduate degree student must be completed before being eligible for a leave. After returning to the program from an approved leave, a second leave is not automatic and will only be granted by the Graduate College for medical or other extraordinary reasons. Leave will not be granted to doctoral candidates who have passed the preliminary exam, except for students whose programs require a formal off-campus activity (e.g., internship), or for documented maternity/family event, medical, family health crisis, or other extraordinary reasons. If this situation occurs, a Graduate Petition for Leave of Absence must be submitted to the Graduate College. Degree-seeking students will automatically be approved leave, with proper documentation, for the birth or adoption of a child or where child care is required (one year maximum); care of a spouse, child, or parent with a serious health condition; or a serious health condition that makes the student unable to pursue graduate work. The Graduate College encourages students to obtain written acknowledgement (signature) from the director of graduate studies. International students with any of these circumstances must also obtain approval form the Office of International Services. Degree-seeking (domestic only) students who must leave the University in order to enter into active service with the armed forces in a national or state emergency will be given an indefinite leave. A copy of the orders to report/proof of active service must be attached. Special procedures exist for withdrawing from courses under these circumstances. See the relevant information under Withdrawal from the University. Time spent on leave approved by the department and the Graduate College does not count towards the time to complete the degree. Students who have already registered for the term for which leave is requested must drop all courses using Student Self-Service in my.uic.edu. If completed before the first day of the term, all relevant charges for the term are eliminated. If done after the first official day of the term begins, a pro rata refund will be given. Students are responsible for filing the appropriate forms and resultant charges; the leave of absence petition itself does not alter existing registration. Students who are on an approved leave of absence will not be covered by the health and personal accident insurance plan until they return to active registration. Petition forms may be obtained from the Graduate College, 606 University Hall, or from the graduate program. Enrolled students or others wishing to attend meetings of a course without earning academic credit may register as visitors (auditors). Because the courses offered by the University of Illinois at Chicago are primarily intended for students registering for academic credit, auditors may register only during the add/drop and late registration period. The privilege of attending classes as an auditor is granted on a space-available basis on or after the first day of instruction. Audit registration requires the approval of the course instructor and the dean of the college offering the course, and must be completed no later than the last day of late registration. The instructor or dean may refuse to permit an audit registration in the course. Degree-seeking students considering the audit option should discuss it with their academic advisors to determine if it is the best choice, or if another grading option, such as credit/no credit, may be more appropriate. Courses taken for audit do not apply toward any academic degree and do not count as part of a student’s full-time or part-time course load for purposes of financial aid, loan deferments, athletic eligibility, or fulfillment of the enrollment residence requirement. Not all courses may be audited. Each college/department may designate courses that do not accept auditors. Students may not audit a course requiring the use of laboratories, studios, or computers; courses offered on an individual instruction basis; military science courses; or physical education and other activity courses. Students who audit a course do not have the privilege of participating in class activities in any way. In courses in which auditing is permitted, the instructor will set the attendance conditions of the audit. When enrollment limits are a concern, students taking a class for credit will be given preference over auditors. Individual college policies may, in some cases, prohibit a student from enrolling for credit after a course has already been taken on an audit basis. A student may not receive academic credit for an audited course nor be eligible to take a proficiency examination. A student who is auditing a course but who wishes to take the course for credit must change his or her registration by the end of the late registration period. There is no limit to the number of courses that may be audited. However, for currently enrolled students, audited courses may be counted toward the maximum number of semester hours allowed for the term. Students who have been dismissed from the University for academic or disciplinary reasons, or are otherwise ineligible to attend classes, are not eligible to audit classes. A student attending as an auditor only is not considered a continuing student. A registration for audit may not be completed until the first day of classes. Persons who wish to audit must obtain a Visitor’s Permit form from the Office of the Registrar during the Late Registration/Add-Drop period. They must secure the written approval of the course instructor and the dean of the college offering the course, submit the approved Visitor’s Permit to Registration and Records, and pay the required audit fee no later than the tenth day of instruction (Please check the Office of the Registrar Web site http://www.uic.edu/depts/oar/registration/policies_procedures.html#dropping for the summer session deadlines). Upon request of the student’s college, an audited course will be indicated on a currently enrolled student’s academic record with a grade of AU. If a currently enrolled student wants an audited course to appear on a transcript, the student should make such a request in the Office of the Registrar. The student should submit a note, signed by the instructor, verifying that the student met the regular attendance policy of the course. Auditors will be assessed an audit fee for the privilege of visiting/auditing a class. Students who are assessed tuition at the full-time rate and those who are exempt from tuition do not pay the audit fee. Students may petition the dean of the Graduate College for exceptions to certain college regulations, but may do so only after consulting with their advisor and the director of graduate studies, whose recommendations must appear on the petition. Petition forms may be obtained from the Graduate College and from the graduate program office and must be accompanied by a full explanation of the circumstances and any appropriate forms and supporting documents required for processing a requested change. Note: Petitions should be filed within 30 days from the time an individual knows, or reasonably should have known, that an occurrence has affected his or her status. Registration procedures are explained in the University Portal, my.uic.edu and class offerings are listed in the Schedule of Classes in my.uic.edu (https://ossswebcs.admin.uillinois.edu/PORTAL_UIC/classsch.html) each semester. Graduate students are responsible for the complete and accurate processing of their registration according to the guidelines published therein. Graduate students who fail to register for two terms in a row (excluding summer) without taking an approved leave of absence forfeit their admission and must reapply to the Graduate College and be readmitted to the program. Readmission is not guaranteed. New students may register during the designated period before the beginning of their first term or during the late registration period (days one to ten for fall and spring, days one to five for summer). Currently enrolled students register during the early registration period in the previous term. Students who wait to register at late registration will be assessed a late registration fee and may experience limited course availability. Registration for zero hours is only available to students who have completed all course work, examinations, and all degree requirements except the master’s project or thesis or doctoral dissertation or capstone project and who need to maintain registered status at the University. Typical reasons for needing to maintain registration after all course hours for the degree have been taken include visa registration requirements, requirements of the student’s program, and the Graduate College requirement for doctoral students to maintain registration from the preliminary examination through the dissertation defense. Students wishing to register for zero hours must submit a Graduate College petition and receive permission from the director of graduate studies and the Graduate College prior to the start of the term. Once permission is received, students may continue to register for zero hours provided they remain in the same program, continue to make satisfactory academic progress, and are within the time frame for degree completion. Students with a fellowship, assistantship, or Graduate College tuition-and-selected-fee waiver must maintain the minimum registration requirements for their award, and will not be eligible for zero hours. Option A is for master’s students in a project or thesis option and doctoral students who need to maintain registration and will be utilizing University services. Master’s students may be required to register for zero hours by their program or USCIS regulations, but the Graduate College does not require registration for defense of a master’s thesis or graduation. Doctoral students (only) who will not be on campus may request Option B, where only the zero-hour tuition, and none of the fees, is assessed. Students on Option B are not eligible to use University services. Doctoral students who want Option B must state Option B and the term(s), up to two semesters at a time, on the petition, and must submit another form if needed in future terms. See Degree Requirements, Doctoral Degrees, and Master’s Degrees. The course is one in which a grade of D, F, NC, or U was received. In such cases the course can be repeated only once and counted only once toward the degree requirements; the original grade continues to be included in the computation of the Graduate Degree GPA. The approval of both the instructor who will give the course and the director of graduate studies is required. The course is one in which a student has received a permanent I (see Grades). Previous graduate work for which a degree was not awarded. Graduate work completed elsewhere after admission to UIC and for which a degree was not awarded. Students considering taking graduate work elsewhere during a leave of absence should consult their advisor and director of graduate studies about such plans and the courses that may be considered for transfer. Graduate work completed in the senior year at UIC that was not applied to the baccalaureate. Additionally, 32 hours may be granted to a doctoral student with a previous master’s degree. The director of graduate studies will determine whether the 32 hours should be granted when the student applies for admission to the program. Technically, this is not transfer credit and does apply to any of the limits listed below. To be considered for transfer, graduate work must have been completed in an accredited institution approved by one of the regional accreditation associations or by the agencies recognized by the Council for Higher Education Accreditation, and must meet the quality and content of courses offered at UIC. For probation and graduation purposes, transfer credit is not computed in the cumulative grade point average or Graduate Degree GPA unless such credit was earned in courses taken at UIC. Maximum Allowed Transfer Credit No more than 25 percent of the hours required for a master’s degree requiring 32–47 hours of credit, or more than 50 percent of the hours required for a master’s degree requiring 48 or more hours of credit, can be transferred from another institution or another college at UIC. Doctoral students may transfer in no more than 25 percent of the hours required for the degree. This limit is for courses taken as a student in another college at UIC or another institution, but not course work taken in a different program within the Graduate College at UIC. Transfer credit is considered only for courses in which the student received a grade of A or B. Credit earned more than six calendar years before admission to the Graduate College is not usually accepted for transfer. Nondegree Credit Nondegree students who are admitted as degree candidates may, by petition, transfer up to 12 semester hours of graduate-level courses in which grades of A or B were earned. This does not count towards the limits of transfer credit listed above. A Graduate Petition for Transfer Credit toward an Advanced Degree is required for all transfers of credit except the 32 hours of credit for a prior master’s degree (see below). The graduate program evaluates the student’s petition and makes a recommendation to the Graduate College. The petition should show the courses recommended for transfer by the graduate program and the number of semester hours of credit received. Students must attach to the petition an original transcript showing grades if courses were not taken at UIC, and a certification from the registrar or college dean of the applicable institution stating that the courses are graduate level and were not used toward fulfillment of the requirements for a degree if not self-evident from the transcript itself. Doctoral candidates who have previously earned a master’s degree or its equivalent approved by one of the regional accreditation associations or by the agencies recognized by the Council for Higher Education Accreditation may be granted 32 semester hours of credit toward the doctoral degree if approved by the program and the Graduate College at the time of admission. The 32 hours are subtracted from the total hours required for the doctorate from the baccalaureate. The 32 hours are not counted toward the maximum allowed transfer credit limit or computed in the cumulative GPA or Graduate Degree GPA. A petition is not required as the Graduate College is informed of the request directly from the director of graduate studies. A copy of the transcript showing the earned degree is required. The following requirements for individual degrees are the minimum standards of the Graduate College. Most graduate programs have requirements that exceed these minimums. Students should consult the detailed graduate program listings in the catalog as well as their director of graduate studies for a full statement of the requirements of their particular degree program. It is the student’s responsibility to be aware of all regulations and requirements and to satisfy them as early as possible. Program and Graduate College policies and requirements change periodically and may not be immediately reflected in campus publications. The online Graduate Catalog is updated each semester to reflect changes to degree requirements and polices. It is located at http://www.uic.edu/gcat. New degree requirements, however, are not imposed retroactively on continuing graduate students. If degree requirements are changed, students may complete their degree programs under the requirements in effect at the time of their initial enrollment (or readmission, if they discontinued degree status at any time) in the Graduate College. They have the option, however, of electing to be governed by the new requirements if they so desire, provided that all requirements of one catalog are met. Students who interrupt their enrollment without prior formal approval lose their status as graduate students (see Leave of Absence). If they want to return to a graduate program, they must apply for readmission. For readmitted students the requirements for the degree are those published in the catalog at the time of readmission, or any subsequent catalog, provided all the requirements of one catalog are met. Time spent on an approved leave of absence will not count towards the time to degree. Students who do not graduate by these deadlines may be dismissed from the Graduate College for failure to progress. Minimum Semester Hours Required At least 32 beyond the baccalaureate; some degree programs require more. Course Work At least 24 hours, or one half of the minimum number of semester hours of graduate work required for the degree, whichever is greater, must be earned as a degree candidate at UIC. At least 9 hours must be at the 500-level, excluding project (597), thesis (598), and independent study courses. Credit Only 400- and 500-level courses can be applied to a graduate degree. Credit toward a graduate degree is only given for courses in which a student received a grade of A, B, C, CR, or S. Graduate programs may establish higher standards. Registration Master’s students who have completed all course credit requirements but have not yet completed a graduation requirement (e.g., thesis, project, or comprehensive examination) are not required to register unless they hold a fellowship, assistantship, or tuition-and-selected-fee waiver. Students who are on a time-limited visa or are in programs that require continuous registration must petition the program and the Graduate College to register for zero hours in an appropriate course (thesis or project). Foreign Language Not required by the Graduate College; may be required by the program. Comprehensive Examination Not required by the Graduate College; may be required by the program. The candidate must be in good academic standing in the Graduate College and the department and have completed all other degree requirements. Thesis or Project Not required by the Graduate College; may be required by the program. Thesis student must earn at least 5 hours in thesis research (the 598 course offered by their program). A maximum of 40 percent of the total hours of credit required for the degree may be earned in thesis research, unless restricted by the program. Defense Once the student has completed all graduation requirements and is in good academic standing, he/she must defend the thesis before a committee if graduating under a thesis option. The thesis committee is appointed by the dean of the Graduate College on the recommendation of the student’s department or program. This committee consists of at least three persons, one of whom should be a tenured full member of the UIC graduate faculty. (See http://www.uic.edu/gcat/GF.shtml for most recent listing of graduate faculty) . One member of the committee may be from outside the department, academic unit, or outside the University, in which case the member must demonstrate equivalent academic standards and his/her curriculum vitae must accompany the Committee Recommendation Form. A Committee Recommendation Form must be submitted to the Graduate College at least three weeks prior to the thesis defense. A majority of the committee must approve the thesis. A candidate cannot be passed if more than one vote of “fail” is reported. The Examination Report must be signed by all members of the committee and submitted to the Graduate College immediately after the defense. The department head or the director of graduate studies will be required to sign the Certificate of Approval Form before a student is considered to have met all the requirements of the thesis. All committee members should be present at the defense. Specific instructions on the format of the thesis are contained in the booklet, Thesis Manual, available in the Graduate College Office, 606 University Hall, and on the Graduate College Web site: (https://grad.uic.edu/pdfs/ThesisManual_rev_07April2009.pdf). Minimum Semester Hours Required At least 96 from the baccalaureate or at least 64 from the master’s degree; some degree programs require more. Credit for Prior Master’s Degree Doctoral candidates who have previously earned a master’s degree or its equivalent from UIC or another accredited institution may be granted 32 semester hours of credit toward the doctoral degree if approved by the program and the Graduate College at the time of admission. Degree equivalency from foreign institutions is determined by the Office of Admissions. The 32 hours are subtracted from the total hours required from the baccalaureate. The 32 hours are not included in the maximum allowed transfer credit limit. A petition is not required as the director of graduate studies informs the Graduate College. Course Work At least 48 semester hours beyond the master’s level or its equivalent must be taken at UIC. The formal course requirements for a master’s degree must be met within the 96 hours. Credit Only 400- and 500-level courses can be applied to the degree. Credit toward a graduate degree is only given for courses in which a student received a grade of A, B, C, CR, or S. Graduate programs may establish higher standards. Registration Doctoral candidates must be registered for credit the term when they take the preliminary exam. They must also register each semester (excluding summer) after passing the preliminary examination and until successfully defending the dissertation. Students who are taking the preliminary exam or defending their dissertation must be registered during the summer session. If an exam or defense occurs between terms, registration is required in the term just ended. Students who hold a fellowship, assistantship, or tuition and fee waiver must register each semester for the number of hours required by their award, even if they have completed all degree requirements except the dissertation. See Course Loads, Financial Aid sections. Option A: Register for zero hours of credit in thesis research (599) each semester until the degree is awarded (excluding summer unless defending dissertation). Range IV tuition and fees are assessed (see Schedule of Classes). Option B: Must petition for each renewal and specify Option B. Only the range IV tuition (including tuition differential, if applicable) is charged (see Schedule of Classes in my.uic.edu at https://ossswebcs.admin.uillinois.edu/PORTAL_UIC/classsch.html). No additional fees are assessed. Students may elect from one to two terms with each petition. Students who elect this option are ineligible for student health insurance, U-Pass, and some on-campus facilities. Permission to use either Option A or B will be considered by the Graduate College upon petition supported by the graduate program. For Option B, the department must certify that no use of University facilities will be made. Students must refile a petition for Option B by the 10th day of the term (5th for summer). All students must complete and defend the dissertation by the degree deadline, regardless of which option is chosen. Examinations Departmental Qualifying Examination: Not required by the Graduate College; may be required by the program. Preliminary Examination (Admission to Candidacy) Purpose: The purpose of the preliminary examination is to determine the candidate’s readiness to undertake dissertation research, and passing it constitutes formal admission to candidacy. The examination serves as the last major step toward the PhD degree except for the completion and defense of the dissertation. The examination provides the student with timely feedback of the faculty’s views of his/her potential for completing the PhD program. The preliminary examination is distinct from the oral defense of the dissertation project. Timing: The preliminary examination is generally administered during or near the end of the time the student has completed most, though not necessarily all, of the course work, but has not made a major investment of time and effort towards the dissertation research project. A minimum of one year has to elapse before the defense of the dissertation after passing the preliminary examination. Only students in good academic standing are permitted to take the examination. Grading: Each member of the examining committee assigns a grade of “Pass” or “Fail.” A candidate cannot be passed with more than one “Fail” vote. The committee may require that specific conditions be met before the “Pass” recommendation becomes effective. On the recommendation of the committee, the head or chair may permit a second examination. A third examination is not permitted. Procedure: The dean of the Graduate College appoints the committee upon receipt of the Committee Recommendation Form three weeks prior to the preliminary examination. The Examination Report must be signed by all members of the committee and the results submitted to the Graduate College immediately after the exam. Once the student has passed the examination, the dean of the Graduate College will notify the student that s/he has been admitted to candidacy. Students who do not complete the degree requirements within five years of passing the preliminary examination must retake the examination; programs may specify a shorter time period. Combined programs leading to two degrees may require additional study beyond the period normally involved for completing requirements for the PhD degree; and may require an extension of the five-year rule. Dissertation A dissertation is required by the Graduate College. Format: The format of the dissertation is specified in the booklet, Thesis Manual, available in the Graduate College Office, 606 University Hall, and on the Graduate College Web site (https://grad.uic.edu/pdfs/ThesisManual_rev_07April2009.pdf). Students should have a draft of their dissertation checked in their department prior to the term they plan to graduate. Programs are responsible for checking the format and adhering to the guidelines. Students must deposit two copies of their defended and departmentally-approved dissertation to the Graduate College by the deadline for that term. A separate abstract (350 words maximum) must be submitted with the final copy. Prior Publication of Research Findings: Candidates engaged in thesis research may find it desirable or expedient to publish, prior to the conferring of the degree, certain findings that later will be incorporated in the dissertation. In such cases, appropriate acknowledgment of the earlier publication should be included in the dissertation. The Graduate College encourages such publication, but the dissertation may not be published in its entirety before all degree requirements, including the defense of the dissertation, have been completed. Defense: The defense of the dissertation is administered after the student has completed all graduation requirements. Only students in good academic standing are permitted to defend their dissertation. All candidates for the PhD degree must have an advisor who is a member of the UIC graduate faculty. The advisor is considered the primary reader of the dissertation. The defense must be open to the academic community of the University and be publicly announced one week prior to its occurrence. The dissertation committee is appointed by the dean of the Graduate College on the recommendation of the student’s department or program. The defense committee consists of at least five persons, of whom one must be from outside their program. The chair of the committee must be a full member of the UIC graduate faculty. At least two members of the committee must be tenured faculty at UIC; at least one must be from outside the degree-granting program, which may include graduate faculty from other UIC departments or colleges. The outside member can also be from outside the University, in which case the member must demonstrate equivalent academic standards; the member’s curriculum vitae must accompany the Committee Recommendation Form. A Committee Recommendation Form must be submitted to the Graduate College three weeks prior to the dissertation defense. All committee members should be present at the defense. The committee vote is “pass” or “fail.” A candidate cannot be passed if more than one vote of “fail” is reported. The Examination Report must be signed by all members of the committee and submitted to the Graduate College immediately after the defense. The department head or director of graduate studies’ signature is required on the Committee Recommendation Form before a student is considered to have met the requirements of the dissertation. Deadlines: Two final, approved and defended copies of the dissertation must be submitted to the Graduate College no later than the Graduate College deadline for that term. PhD candidates who successfully defend their dissertation and submit the final dissertation copy to the Graduate College after the deadline will graduate in the next term. Microfilm Fee: Following the final examination and acceptance of the thesis, candidates must pay a fee for the microfilming of the complete dissertation and the publication of the abstract in Dissertation Abstracts. Consult the Thesis Manual for more information. Effective Fall 2013, Graduate College policy requires doctoral programs to conduct an annual assessment of their doctoral students. Annual assessments are encouraged, though not required, for master’s students. Although programs have options on the content and timing of the assessment, for uniformity and the sake of good practice, the policy requires annual assessment of all doctoral students. In addition, care has been taken to ensure that the policy guards against potential conflicts of interest by requiring that the assessment of doctoral students contains an independent element. A student self-assessment of academic progress, and an opportunity for the student to provide evidence of his/her progress. An assessment of the student’s academic progress from his/her doctorate advisor (if he/she has one). A written review prepared by an individual or group different from the advisor (e.g., the Director of Graduate Studies (DGS), Department Head/Chair, or group of faculty) that will focus on the student’s degree progress, including completion of milestones and student strengths and weaknesses. A copy of the review, that includes items (1) and (2), must be provided to the student. A timely opportunity for the student to discuss this review in person with the DGS (and adviser, when appropriate), if requested by the student. In the event that the student’s advisor is the DGS a suitable third party (e.g. the department chair/head or other senior professor) should lead the discussion. An opportunity for written student feedback to the formal review. All of the above are to be retained in the student’s academic file in the program/department. The requirements listed above represent minimum actions, and programs may further develop reviews to incorporate additional items. For additional information refer to http://grad.uic.edu/cms/?pid=1001054. The Student Academic Grievance Procedures define an administrative process through which students may seek resolution of complaints or Grievances regarding academic standing during their enrollment at UIC. These procedures are available on the UIC Web site at http://www.uic.edu/depts/oaa/faculty/FINAL_VERSION_STUDENT_PROCEDURES.pdf. As an academic community, the University of Illinois at Chicago is committed to providing an environment in which research, learning, and scholarship can flourish and in which all endeavors are guided by academic and professional integrity. All members of the campus community—students, staff, faculty, administrators—share the responsibility of insuring that these standards are upheld so that such an environment exists. Instances of academic misconduct by students, and as defined herein, shall be handled pursuant to the Student Disciplinary Policy which is available online http://www.uic.edu/depts/dos/docs/StudentDisciplinaryPolicy0809withpagenumbersandcov.pdf. Cheating Either intentionally using or attempting to use unauthorized materials, information, people, or study aids in any academic exercise, or extending to or receiving from another person any kind of unauthorized assistance on any examination or assignment. Fabrication Knowing or unauthorized falsification, reproduction, lack of attribution, or invention of any information or citation in an academic exercise. Facilitating Academic Dishonesty/Plagiarism Intentionally or knowingly representing the words or ideas of another as one’s own in any academic exercise. Bribes, Favors, Threats Bribing or attempting to bribe, promising favors to or making threats against any person with the intention of affecting a record of a grade or evaluation of academic performance. Any conspiracy with another person who then takes or attempts to take action on behalf or at the direction of the student. Examination by Proxy Taking or attempting to take an exam for someone else is a violation by both the student enrolled in the course and the proxy or substitute. Grade Tampering Any unauthorized attempt to change, or actual alteration of grades or any tampering with grades. Nonoriginal Works Submission or attempt to submit any written work authored, in whole or part, by someone other than the student. The main purpose of the Student Disciplinary Policy is to insure that students receive due process—which means that every student should have a fair opportunity to express their side of the story before any decisions are made about their disciplinary case. The Student Disciplinary Policy was designed to be educational in nature. The Student Disciplinary Policy is available online at http://www.uic.edu/depts/dos/docs/StudentDisciplinaryPolicy0809withpagenumbersandcov.pdf. The right to inspect and review the student’s education records within 45 days of the day the University receives a request for access. Students should submit to the Office of the Registrar, dean, department head, or other appropriate records custodian, written requests that identify the record(s) they wish to inspect. The University official will make arrangements for access and notify the student of the time and place where the records may be inspected. If the records are not maintained by the University official to whom the request was submitted, that official will advise the student of the correct official to whom the request should be addressed. The right to request the amendment of the student’s education records that the student believes are inaccurate or misleading. Students may ask the University to amend a record that they believe is inaccurate or misleading. They should write to the University official responsible for the record, clearly identify the part of the record they want changed, and specify why it is inaccurate or misleading. The right to consent to disclosures of personally identifiable information contained in the student’s education records, except to the extent that FERPA authorizes disclosure without consent. One exception, which permits disclosure without consent, is disclosure to school officials with legitimate educational interests. A school official is a person employed by the University in an administrative, supervisory, academic, research, or support staff position (including law enforcement personnel and health staff); a person or company with whom the University has contracted (such as an attorney, auditor, or collection agent); a person serving on the University of Illinois Board of Trustees; or a student serving on an official committee, such as a disciplinary or grievance committee, or assisting another school official in performing his or her tasks. A school official has a legitimate educational interest if the official needs to review an education record in order to fulfill his or her professional responsibility. Upon request, the University of Illinois at Chicago will disclose education records without consent to officials of another school in which a student seeks or intends to enroll. The right to file a complaint with the U.S. Department of Education concerning alleged failures by the University of Illinois at Chicago to comply with the requirements of FERPA. FERPA prohibits access by non-University personnel to information about individual students without the student’s written authorization, except that which is considered public information. The University of Illinois at Chicago hereby designates the following as public or “directory information.” Such information may be disclosed by the University for any purpose, at its discretion. University e-mail; and permanent city, state, and postal ZIP code. Class/Level (Graduate, Undergraduate, Professional, Nondegree/Freshman, Sophomore, Junior, Senior). College and major field of study/Concentration/Minor. Day and month of birth. Weight and height if the student is an athletic team member. Current term hours enrolled and enrollment status (full-time, part-time, not enrolled, withdrawn and date of withdrawal). Awards, honors and achievements (including distinguished academic performance), with dates. Eligibility for membership in honoraries. For Students appointed as fellows, assistants, graduate, or undergraduate hourly employees, the title, appointing department, appointment date, duties and percent time of appointment. To examine his or her record, the student must submit a written request to the Office of the Registrar. This office will comply with the request within a reasonable amount of time, not to exceed 45 days after receipt of the request. To prevent the release of directory information, the student must submit a request form to the Office of the Registrar no later than the tenth day of the semester (fifth day of summer session). Such requests for nondisclosure will be honored so long as the student is continuously enrolled or unless he/she sooner revokes the request in writing. The Illinois Department of Public Health requires that all students living in on-campus housing and born on or after January 1, 1957, entering a post-secondary institution are required to present documented proof of immunity against measles, mumps, rubella, tetanus, and diphtheria as a prerequisite to registration. The Medical Immunization Form, required for student completion, can be found at http://registrar.uic.edu under the Records tab. Those students living in on-campus housing who are not properly immunized and have not submitted a written statement of medical or religious exemption must be immunized within the first term of enrollment. Failure to provide the required proof of immunity will prevent the student from enrolling in a subsequent term. Students living in on-camus housing and registering only for no more than five credit hours are temporarily exempt from the immunization requirements. For more information, contact the Office of Medical Immunization Records, http://www.uic.edu/depts/oar/student_records/medical_immunization.html, or Room 1300 Student Services Building, telephone (312) 413-0464. The Disability Resource Center works to ensure the accessibility of UIC programs, classes, and services to students with disabilities. Services are available for students who have documented disabilities, vision or hearing impairments, emotional or physical disabilities. Students with disability/access needs or questions may contact the Disability Resource Center at (312) 413-2183 (voice) or (312) 413-0123 (TTY only) or visit the Web site http://www.uic.edu/index.html/disability.shtml . Students who have ethical concerns about the use of animals in teaching have the responsibility to contact the instructor, prior to enrollment in any course in which animals may be used as part of course instruction, to determine whether class exercises involving animals are optional or required, and what alternatives, if any, are available. If no alternatives are available, the refusal to participate in required activities involving animals may result in a failing grade in the course. Students using human subjects in any research (this includes surveys, interviews, preexisting data, and human tissue obtained for nonresearch purposes) must have approval from the Institutional Review Board or one of its approved committees before they begin data collection. Students using animal subjects (including observation-only studies) must take GC 470—Essentials for Animal Research. The Graduate College also offers the course, GC 401—Scientific Integrity and Responsible Research. This course is mandatory for a number of graduate programs. Similar programs for nonscience disciplines are being developed. For further information, students should contact the Office for the Protection of Research Subjects, (312) 996-1711, 203 Administrative Office Building. Sexual harassment is defined by law and includes any unwanted sexual gesture, physical contact, or statement that is offensive, humiliating, or an interference with required tasks or career opportunities at the University. Sexual harassment is prohibited under federal and state discrimination laws and the regulations of the Equal Employment Opportunity Commission. The University of Illinois will not tolerate sexual harassment of students or employees and will take action to provide remedies when such harassment is discovered. The University environment must be free of sexual harassment in work and study. In order to assure that the University is free of sexual harassment, appropriate sanctions will be imposed on offenders in a case-by-case manner. The University will respond to every complaint of sexual harassment reported. Information about the University’s approved procedures for dealing with cases of sexual harassment may be obtained by phoning (without name given if desired), by writing, or by visiting the Office for Access and Equity, 717 Marshfield Building, 809 S. Marshfield Avenue, Phone (312) 996-8670. Identification Card (I-card): All cardholders are required to abide by the University Card Terms and Responsibilities. Students are responsible for abiding by card terms and responsibilities. A card is the property of the University of Illinois, and I must return it to a Campus ID Center upon leaving the University or upon request. Card data, including but not limited to the University Identification Number (UIN), card number, and photo, may be used for University purposes. A card is issued to assist in the identification of the valid cardholder and is to be presented upon request for securing privileges and services. A card is valid only while I am a registered student, active University employee, or University retiree, or until the card expires or is revoked. A card is non-transferable and does not authorize me to obligate the University of Illinois in any way. Altering or intentionally damaging an ID card, using another person's ID card, or allowing my card to be used by another person may result in disciplinary action and confiscation of the card. I am responsible for paying any replacement fee when an ID card is lost, stolen, confiscated, or intentionally damaged, or when any information is changed at my request. I should notify a Campus ID Center immediately if a card is lost or stolen. If a confiscated, surrendered, lost, stolen, or otherwise damaged card has a balance on the value stripe, there is no guaranteed refund on the unused balance on the card. I am responsible for notifying a Campus ID Center to deactivate the online functionality of an ID card (Meal Plans, Dragon Dollar$, or Campus Cash) should the card be lost or stolen. I understand and agree that if I link an i-card to a TCF Bank account I am releasing my UIN (as part of the card number) to TCF Bank. Also, I am responsible for notifying TCF Bank if the linked card is lost or stolen. All students are assessed tuition and fees. The amount varies with the program the student is in, the number of semester hours for which the student registers, and according to status as a state resident or nonresident of Illinois. Residence classification is determined by the information given on the application for admission and other credentials. Further information on resident classification is provided elsewhere in this chapter. Consult the Office of the Registrar Web site for information on current tuition and fee rates (http://www.uic.edu/depts/oar/prospective_students/tuition.html). The service fee, general fee, health service fee, student-to-student fee, CTA U-Pass transportation fee (assessed for full-time study defined as 9 hours), the academic facilities maintenance fund assessment, and the library and information technology assessment are mandatory fees/assessments that support the following: Student Center East and Student Center West, Student Programs, Student Counseling, Intramural Sports and Recreation, Intercollegiate Athletics, Bonded Indebtedness, Health Service, Pharmacy, CTA usage, and maintenance of UIC academic facilities. In addition, all students are covered by the UIC Student Health Benefit Program (CampusCare) and an accidental death and dismemberment policy for which they pay a fee each term. Students who present evidence of insurance in force that provides equivalent coverage may apply for an exemption from the student health insurance fee. Students who owe any money to the University will have a hold placed on their academic records. This hold precludes students from registering for any subsequent terms. In addition, transcripts will not be released until the student’s account has been paid in full. Past due accounts are subject to a finance charge at the annual percentage rate of 18% (1.5 per month on the unpaid balance of each month). Additionally, a late fee of $2.00 per month will be added to all past due accounts. Please note, the University of Illinois at Chicago does refer past due accounts for collection. Where appropriate, the University will authorize legal action to effect settlement of an account. Students will be liable for all reasonable collection costs, including attorney fees and other charges necessary for the collection of a past due account. Holders of tuition-and-selected-fee waiver scholarships. All academic employees of the University (except graduate assistants) on salaried appointment for at least 25 percent of full-time service. Such appointments require service for not less than three-fourths of the number of days defined for the term. Teaching, research, and graduate assistants on appointment for at least 25 percent but not more than 67 percent of full-time service. Such appointments require service for not less than three-fourths of the number of days defined for the term. Support staff employees of the University in status appointments or in appointments designed to qualify for status in an established class (e.g., trainee, intern) who register in regular University courses not to exceed Range II tuition in semester if on full-time appointment, and not to exceed Range III tuition if on a 50 to 99 percent time appointment, provided they (1) meet conditions and eligibility for admission as prescribed by the Office of Admissions and Records, (2) not be students as defined in Civil Service Rule 7.7c, and (3) have approval from their employing departments for enrollment and a makeup schedule to cover any time in course attendance during their regular work schedule. Employees whose total registration is in a higher range than that authorized by their tuition waiver pay only the difference between the waiver authorization and the higher range in which their total registration places them. Support staff employees in a status, learner, trainee, apprentice, or provisional appointment who enroll in regular courses directly related to their University employment. The number of credit hours per semester may not exceed Range II. Employees must have made application and received prior approval for enrollment as required by procedures issued by the director of support staff personnel and set forth in Policy and Rules—Nonacademic. Holders of graduate tuition-and-selected-fee waivers awarded by the Graduate College. Holders of grants or contracts from outside sponsors that provide payments to cover the total costs of instruction. Cooperating teachers and administrators who receive assignment of practice teachers or TESOL interns. Such persons who register in University courses are exempted from tuition, the service fee, and the general fee for one semester or summer session for each semester of service rendered. The exemption shall apply to the semester or summer session of registration, as designated by the student, that is concurrent with or following the term of service, but must be applied no later than one calendar year from the end of the term of service. Concurrent registration on more than one campus of the University or in University extramural courses constitutes one semester or session of eligibility for exemption. Persons registered in noncredit seminars only. University employees registered at the request of their departments in noncredit courses especially established to improve the work of the employee. All staff members (academic, including teaching and research assistants, administrative, or permanent nonacademic) on appointment for at least 25 percent of full time with the University. The faculties of state-supported institutions of higher education in Illinois holding appointments of at least one-quarter time. The professional staff in private and public elementary and secondary schools in Illinois. Persons actively serving in one of the armed forces of the United States who are stationed and present in Illinois in connection with that service. The spouses and dependent children of those listed in 5, as long as they remain stationed, present, and living in Illinois. The University of Illinois is a land-grant institution assisted by funding from state of Illinois tax revenue. As a state, tax-assisted institution, the University (with some exceptions) extends preference in tuition to residents of the state of Illinois—that is, to students whose circumstances conform to the University’s definition of state resident status stated below. The University of Illinois’ definition of the term “resident” may be different from the definitions developed by other, non-University agencies. Thus, a person who is an Illinois resident for tax or voting purposes, for example, is not necessarily a state resident for University of Illinois tuition and admission purposes. The University’s definition of state resident status applies both to payment of tuition and admission to the University of Illinois. Principal elements determining state residency are domicile in Illinois and actions that evidence the intent to make Illinois the person’s permanent residence. A person has but one domicile at any time. Mere physical presence in Illinois, regardless of how prolonged, is insufficient to establish state residency without existence of action and intention to make the place a permanent residence and principal home. In order to establish bona fide residence in Illinois under this policy, a person must demonstrate presence and intent to reside permanently in Illinois for reasons other than educational objectives. The burden of establishing that a student is domiciled in Illinois for other than educational purposes is upon the person. The regulations, factors, and procedures enumerated in this policy will be considered by the University in determining state residence status. State residence status regulations are subject to change from time to time at the discretion of the Board of Trustees. A person holding nonresident status is subject to rules in effect when the petition seeking Illinois residency is filed. Nothing in these rules shall be applied retroactively to reverse in-state residence status previously granted under former regulations. A. A person’s domicile is presumed to be that of his/her parent(s) or legal guardian unless the student is independent and establishes a separate domicile. A person who is dependent upon his/her parent(s) or other person in authority, other than spouse, for financial support shall not be considered independent for the purpose of these regulations. A person claiming independence may be requested to present satisfactory evidence that his/her parent(s) or legal guardian have not contributed significantly to his/her support nor claimed him/her as a dependent for federal or state income tax purposes during the period in which the person attempts to establish and/or maintain residency. Filing and payment of Illinois income tax is necessary to establish residency. D. A person who is not a citizen of the United States of America may establish resident status unless the person holds a visa, which precludes an intent to permanently reside in the United States. A list of the visa classifications may be obtained from the Office of Admissions and Records. E. Noncitizens may commence establishment of state residence with notification of permanent residency status by the United States Citizenship and Immigration Services provided the person meets and complies with all the applicable requirements of these Regulations. F. The minor children of persons who, having resided in this state for at least 12 months immediately prior to such a transfer, are transferred by their employers to some location outside the United States shall be considered as Illinois residents for purposes of the computation and payment of tuition. However, this Section shall apply only when the minor children of such parents enroll in a state-supported college or university within five years from the time their parents are transferred to some location outside the United States. If the parent(s) or legal guardian of a resident person establishes a domicile outside the state of Illinois after the person has been admitted, the person shall continue to be classified as a resident student until degree completion, assuming timely matriculation and providing the person maintains continuous enrollment and maintains a separate residence within the state of Illinois. G. It is required that a person who claims Illinois domicile while living in another state or country will provide proof of the continued Illinois domicile. Proof may include, but is not limited to, evidence that the person (or parent or legal guardian as applicable) has not acquired a domicile in another state, has maintained a continuous voting record in Illinois, and has filed regular Illinois resident state income tax returns during absence from the state. H. A person whose parents move to Illinois may become a resident at the beginning of the next term following the move. An independent person whose parent or parents have established and are maintaining a bona fide residence in Illinois will be regarded as a resident if the independent person lives in Illinois. Even though a divorced or separated parent who is not a resident of Illinois provides significant financial support, a person shall be classified as a resident as long as the other parent resides permanently in Illinois. I. A nonresident shall be classified as a resident if his/her spouse is a resident of Illinois and meets the applicable requirements of these regulations. A noncitizen may establish residency through his/her resident spouse, provided the noncitizen complies with Section D of these regulations. J. A person who is actively serving in the armed forces of the United States and who is stationed and/or present in the state in connection with that service, may be eligible for a waiver of the nonresident portion of tuition in accordance with Board policy as long as the person remains stationed and/or present in Illinois. The waiver is extended to the person’s spouse and dependent children when they also live in the state. A resident of Illinois, and the spouse and dependent children, who is stationed outside of Illinois in active service in the armed forces of the United States and who has maintained residency under Section G shall be classified as a resident. K. Staff members of the University and of allied agencies, and faculties of state-assisted institutions of higher education in Illinois, holding an appointment of at least one-quarter time, and their spouses and dependent children, shall be treated as residents. The term “staff member” as used in these regulations shall mean a person appointed to a faculty, academic professional, or permanent civil service position for a specific amount of time at a salary or wage commensurate with the percentage of time required. The appointment shall require service for not less than three-fourths of the term. For purposes of residency, the term “staff member” shall not apply to persons employed on an hourly basis in an academic capacity, nor to persons on leave without pay. L. Nonresident teachers in the private and public elementary and secondary schools in Illinois holding an appointment of at least one-quarter time shall, if required to pay tuition, be assessed at the resident rate. This privilege also extends to the summer session immediately following the term of the appointment. Any nonresident teacher who qualifies for resident tuition as described above shall become subject to nonresident tuition for the entire term if the school appointment is vacated prior to completion of three-fourths of the term in question. Resignation or cancellation of the appointment prior to the close of the spring term also cancels the eligibility for the resident tuition privilege in the following summer term. Bona fide residency must be maintained in the state of Illinois for at least one calendar year immediately preceding the date of receipt of the application for admission; or for tuition purposes, one calendar year immediately preceding the first scheduled day of classes for the term for which resident classification is sought. The following circumstances, although not necessarily conclusive, have probative value in support of a claim for state resident classification. Continuous physical presence—defined as no more than a three-week absence from the state of Illinois—for at least one calendar year as described above. Domicile in Illinois of parent(s) or guardian legally responsible for the student. Domicile in Illinois of spouse. Voting or registration for voting in Illinois. Illinois driver’s license or identification card and automobile registration. Financial independence and payment and filing of Illinois income/property taxes and/or ownership of property in Illinois during the tax year or partial tax year immediately preceding the term for which the person is requesting resident classification. Just the filing of an Illinois state income tax form, or filing a form without substantial Illinois income earned, will not be judged as a significant criterion for reclassification. One calendar year of gainful employment in Illinois or proven reliance upon resources in Illinois for more than fifty percent of the income sufficient to provide for tuition, fees, and normal living expenses, e.g., food, clothing, housing, and transportation. Reliance upon income earned from loans is not viewed as evidence of intent to establish residency. Employment in Illinois must be in other than graduate assistantships or student employment. The lease of living quarters and payment of utility bills in Illinois. Former domicile in the state and maintenance of significant connections therein while absent. Admission to a licensed practicing profession in Illinois. Long-term military commitments in Illinois and/or proof that Illinois is the home of record. A one calendar year period of presence in the state for other than educational purposes. Establishment of financial accounts at Illinois institutions. Public records, for example, birth and marriage records. Other official documents verifying legal, official connection with Illinois or with organizations or institutions within the state of Illinois. Exclusive use of the Illinois address when home or mailing address is requested. The University may request documentation of the evidence. Missing evidence, the lack of evidence, or inconsistent evidence may be used to refute the claim of state residency. The executive director of admissions, or a designee, shall determine the initial state residence classification of each person at the time the person enters or re-enters the University. A person who is not satisfied with the determination of his/her state residence classification may request that the responsible official reconsider it. For the purposes of admission, the written request must be received by the Office of Admissions and Records within 20 calendar days from the date of notification of state residency status. For the purposes of assessment of tuition, the written request must be received by the Office of Admissions and Records by September 30 for the fall semester, February 15 for the spring semester, June 20 for the summer term, or some other date as set by the Office of Admissions and Records. The request should include the Petition for Determination of Residency Status (available online and from the Office of Admissions and Records) and all other materials that are applicable to the claim. The request and accompanying documentation will not be returned, and the person is advised to maintain a copy for his/her record. If the person is still not satisfied with the determination after it has been reconsidered, the person may appeal the decision to the director, Office of University-Wide Student Programs. The appeal shall be in writing and shall include reasons for the appeal. The appeal must be received by the executive director of admissions within 20 calendar days of the notice of the ruling. The appeal will then be referred to the Office of University-Wide Student Programs. A person who fails to file such an appeal within 20 calendar days of the notice of the ruling waives all claims to reconsideration for that academic session. Filing deadlines cannot be extended or waived, and late applications and appeals will not be reviewed. The decision of the Office of University-Wide Student Programs shall be final in all cases. A person may be reclassified at any time by the University upon the basis of additional or changed information. If the person is classified in error as a state resident, nonresident tuition shall be assessed in the next term; if the person is classified in error as a nonresident, state resident tuition shall be assessed in the term in which the classification occurs, provided the person has filed a written request for a review in accordance with these regulations. A person who fails to notify the University of a change of facts or provides false information that might affect classification or reclassification from state resident to nonresident status and/or who provides false information or conceals information for the purpose of achieving resident status may be subject to appropriate disciplinary action, as well as other penalties which may be prescribed by law. Further information or clarification may be secured by contacting the Executive Director of Admissions, 1100 Student Services Building (MC 018), University of Illinois at Chicago, Office of Admissions and Records, Box 5220, Chicago, Illinois 60680-5220. Holders of Board of Trustees tuition and fee waivers awarded by the Graduate College. All graduate assistants holding an appointment between 25% and 67% time who meet the conditions of the waiver. Students registered in absentia via approved petition for zero hours, Option B only. This fee supports staff salaries, programming and general operating expenses for the campus health service providers: Family Practice/Student Health Center, the Counseling Center, the Wellness Center and pharmacy services. The fee is mandatory. This fee is waived with a tuition and selected fee waiver. The Academic Facilities Maintenance Fund Assessment (AFMFA) is assessed to graduate/professional students to address the deferred maintenance backlog in academic facilities. For less than full-time enrollment, the AFMFA will be based on enrolled credit hours pro-rated according to range calculations. This fee is waived with a tuition and fee waiver. This fee assessed to students in the Graduate College who are registered for 9 or more hours. This fee is not waived with a tuition and fee waiver. This fee is assessed of all auditors who are not in Range I in the tuition and fee schedule. UIC students registered for at least 12 semester hours and University employees who are eligible for a tuition waiver do not have to pay the Course Auditor’s fee. Contact the Office of the Registrar for current fee information. In order to improve the learning environment, a Library and Information Technology Assessment is charged to graduate/professional students enrolling Fall 2008 and after. While all students will be assessed this mandatory fee at registration, refunds are available upon request. A request for refund must be supported by a confirmed schedule and University Photo ID Card during the first two weeks of the term. This is processed through SINC, located on the first floor of Student Center East. West side students may pick up a credit form in Room 111, Marshfield Building. Withdrawal from the University is governed by specific regulations that students should observe to protect their academic standing. Failure to withdraw officially from the University before the last day of instruction results in a grade of F (failure) appearing on the record for each course in which the student is registered. Students dropping the only course, or all courses, for which they are enrolled should follow University withdrawal procedures. Students who withdraw by the tenth day of the semester are not considered to have been registered for that term, and the withdrawn courses will not appear on the student’s transcript. Students who withdraw after the tenth day are considered “in residence” for that term, and are eligible to register for the next term. Please check the Office of the Registrar Web site for the summer session deadlines for withdrawing from courses. The withdrawn courses will appear on their transcript with a W grade. Graduate students who wish to withdraw may withdraw before the tenth day of the semester by completing the process using Student Self-Service in my.uic.edu. Students who wish to withdraw after the tenth day may secure copies of the withdrawal form from their director of graduate studies or the Graduate College. Please check the Office of the Registrar Web site (http://www.uic.edu/depts/oar/) for the summer session deadlines for withdrawing from courses. Graduate students in a degree program should initiate official withdrawal by consulting their director of graduate studies for approval. Nondegree students who were not admitted to a specific department should initiate withdrawal from the Graduate College. Note: Graduate students who fail to register for two terms in a row (excluding summer) without taking an approved leave of absence forfeit their admission to the Graduate College. Like students who have officially withdrawn from the University before the tenth day of the semester (fifth day in summer), they must reapply for admission to the Graduate College. Readmission is not guaranteed. A graduate student who must leave the University in order to enter into active service with the armed forces in a national or state emergency (including being called up for the Active Reserve Forces and the National Guard) during the first twelve weeks of the semester (first six weeks in summer session) will be withdrawn from courses with a full refund of tuition and fees. If called to active duty after that time, and before the end of the term, the student may withdraw from all courses with a full refund of tuition and fees, or, the student may ask the instructor(s) for permission to receive an Incomplete (I) or Deferred (DFR) grade(s). An instructor may assign an I or DFR if deemed academically appropriate and feasible. Alternatively, an instructor may assign a letter grade, if requested by the student, if the instructor deems it to be academically justified. Deadlines for incomplete grades under these circumstances may be waived upon the discretion of the instructor and the Graduate College. A student who chooses to withdraw from all courses will not receive Ws. It is the student’s responsibility to present proof of active service status for these actions to occur. Students who must withdraw due to the reasons stated above are given an indefinite leave of absence. See Financial Obligations and Refunds and Leave of Absence for additional information. Withdrawal from Term request If a student submits a Withdrawal from Term Request via via Student Self-Service during the first two weeks (Fall/Spring) or first week (Summer) of the term, he/she is eligible for a 100% cancellation of tuition and fees. Please see the Office of the Registrar Web site for more information, including deadlines for Part A and B of term courses: http://www.uic.edu/depts/oar/financial_matters/refund_schedule.html. Withdrawal from the University A pro rata refund of tuition and fees (excluding health service and student health insurance fees) will be issued to students who withdraw between the second and the tenth weeks of the semester. Before a refund is made to the student, the University will make a refund to the appropriate financial aid programs providing assistance to the student. Any amount remaining will be paid to the student. Please see the Office of the Registrar Web site for more information, including the refund schedule and deadlines for Part A and B of term courses: http://www.uic.edu/depts/oar/financial_matters/refund_schedule.html. Dropping a Course If, between the second and tenth day, a student drops a course(s) and by so doing changes the tuition range, he or she is eligible to receive a refund or credit for the difference in range. Please check the Office of the Registrar Web site (http://www.uic.edu/depts/oar/registration/policies_procedures.html#dropping ) for the summer session deadlines for dropping courses. Dropping a course after that date without withdrawing from all courses does not result in a reduction of charges. Withdrawal by an Auditor A full refund is issued if the withdrawal is made within the first ten days of instruction of the semester. Thereafter, no refund is made. Please check the Office of the Registrar Web site (http://www.uic.edu/depts/oar/registration/policies_procedures.html#withdrawalSum ) for the summer session deadlines for withdrawing from courses. Refund on Withdrawal to Enter Military Service A graduate student who must withdraw due to being called into active service with the armed forces in a national or state emergency (including being called up for the Active Reserve Forces and the National Guard) will receive a full refund of tuition and fees. The refund of tuition and fees for graduate students who receive financial aid from federal and state programs and private foundations will be governed according to the rules and regulations of those organizations. For students who hold fellowships, the Graduate College will make every effort to restore those awards upon return to UIC. Assistantships (teaching, research, or graduate) are awarded by colleges, graduate programs, research centers and administrative offices, and graduate students who have assistantships should check with those units about the availability of the assistantships upon return from active military service. Graduate students living in University residences will receive a pro rata refund for room and board based on the date of withdrawal. It is the student’s responsibility to present proof of active service status for these actions to occur. See Withdrawal from the University for additional information. The above refund policies do not apply to the application fee, which is not refundable. Students who have paid all University fees can obtain their transcripts by submitting a written request to the Office of the Registrar and paying the transcript fee. Transcripts and other academic information are provided by the Office of the Registar only at the written request, either written or using the online order procedure, of the student. Contact the Office of the Registrar for current fees or visit their website at http://www.uic.edu/depts/oar/current_students/transcripts.html. Students needing certification of completion of degree requirements may obtain such certification from the Office of the Registrar.